Review posted April 1, 2018. Jericho Books, 2013. 206 pages. A big thank-you to my friends Charles and Laura who gave me this book for Christmas after convincing me to read Nadia Bolz-Weber’s next book, Accidental Saints, which was a 2017 Sonderbooks Stand-out. I already had this book checked out from the library, but it was nice to have my own copy to keep and to mark the good parts. 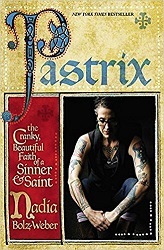 The book is autobiographical, telling how the author went from being an alcoholic on the road to self-destruction to become a Lutheran pastor, or pastrix, as some call her to try to insult her. She has adopted and redefined the term to mean a female ecclesiastical superhero. These were my people. Giving PJ’s eulogy, I realized that perhaps I was supposed to be their pastor. It’s not that I felt pious and nurturing. It’s that there, in that underground room filled with the smell of stale beer and bad jokes, I looked around and saw more pain and questions and loss than anyone, including myself, knew what to do with. And I saw God. God, right there with the comics standing along the wall with crossed arms, as if their snarky remarks to each other would keep those embarrassing emotions away. God, right there with the woman climbing down the stage stairs after sharing a little too much about PJ being a “hot date.” God, among the cynics and alcoholics and queers. I am not the only one who sees the underside and God at the same time. There are lots of us, and we are at home in the biblical stories of antiheroes and people who don’t get it; beloved prostitutes and rough fishermen. How different from that cast of characters could a manic-depressive alcoholic comic be? It was here in the midst of my own community of underside dwellers that I couldn’t help but begin to see the Gospel, the life-changing reality that God is not far off, but here among the brokenness of our lives. And having seen it, I couldn’t help but point it out. For reasons I’ll never quite understand, I realized that I had been called to proclaim the Gospel from the place where I am, and proclaim where I am from the Gospel. What had started in early sobriety as a reluctant willingness to start praying again had led to my returning to Christianity, and now had led to something even more preposterous: I was called to be a pastor to my people. This book is about that journey, and is filled with many stories along the way of people touched by God’s grace – including herself (not in a prideful way – when she really needed it). There’s lovely stuff here, as well as convicting stuff. Nadia Bolz-Weber is a gracious person because she doesn’t claim to have it all together, to be doing everything right, or to have the only right way to God. Her writing helps me see God’s amazing grace manifested in and displayed toward all of God’s children in all their messy glory.